Calling all pizza lovers! This plant based, gluten-free pie is loaded with protein and also contains a good deal of B vitamins, iron, magnesium and potassium. 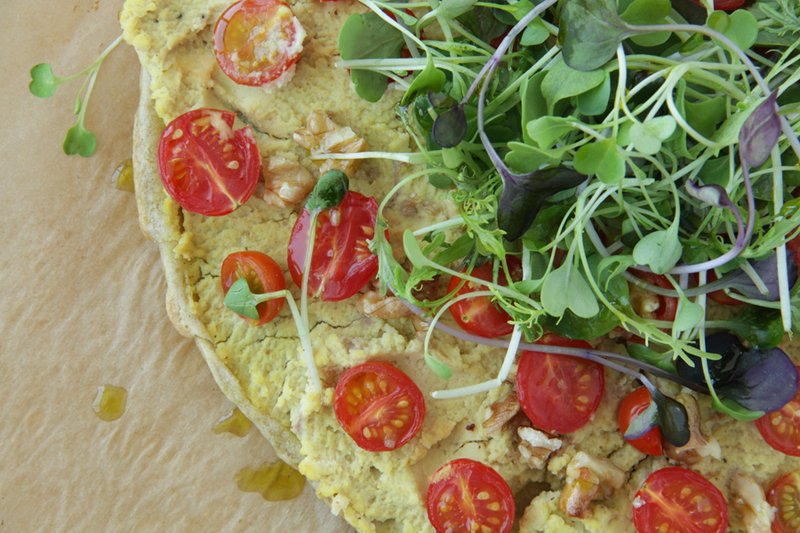 The base is actually a traditional recipe for socca, which is a flatbread made from garbanzo bean flour,water and few herbs. 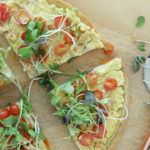 This chickpea flour crust provides sets a foundation for the creamy vegan ricotta and pile of veggies and together they form a totally yummy healthy powerhouse! 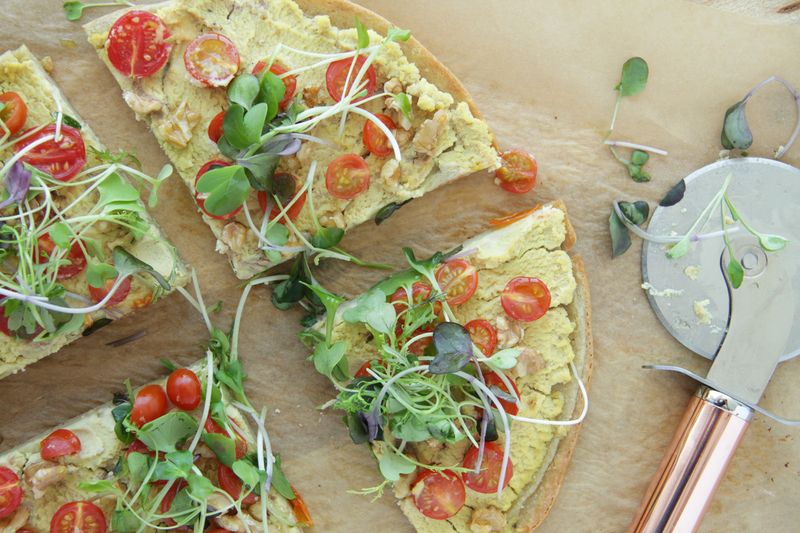 Garbanzo flour is one of the most nutrient-packed gluten-free flours available. Traditionally made by grinding raw chickpeas, it’s full of healthy protein and fiber. Garbanzo flour also offer a good array of vitamins and minerals. For example, it contains calcium and magnesium in an ideal ratio, a very high amount of folate — which is essential for a healthy pregnancy — good dose of energizing B vitamins like vitamin B6 and a decent amount of heart-healthy potassium. This flour even contain some of the powerful antioxidant mineral selenium, as well as iron and plenty of plant-based protein. Make the batter: Place the chickpea flour, water, 1 Tbs coconut oil, garlic salt, pepper and herbs in a high speed blender. Blend on medium speed for 1 min. Let stand for 15-20 minutes at room temperature. Meanwhile make the ricotta cheese. Place all ingredients into a blender or food processor, process until creamy stopping to scrape down the sides every coupe of minutes. Taste for flavors adding any additional ingredients. Set aside. Add 1 tbsp of coconut oil to the pan and swirl it around to coat pan. Slowly pour in your chickpea batter. Tilt pan to make sure batter fills in evenly. Change oven temperature to 425F and place pan back in for 5- 8 minutes - depending on the size of your pan. Bigger pan = pizza will be thinner and will probably take less time, so check at 5 minutes.Once the batter is set, remove it from the oven. Spread the ricotta on top. Then add sliced tomatoes and sprinkle walnuts on top. Place back in oven for 10-15 minutes until the pizza is crispy and brown on outside. Remove from the oven. Carefully slide the pizza crust onto a marble/stone or heat safe surface. 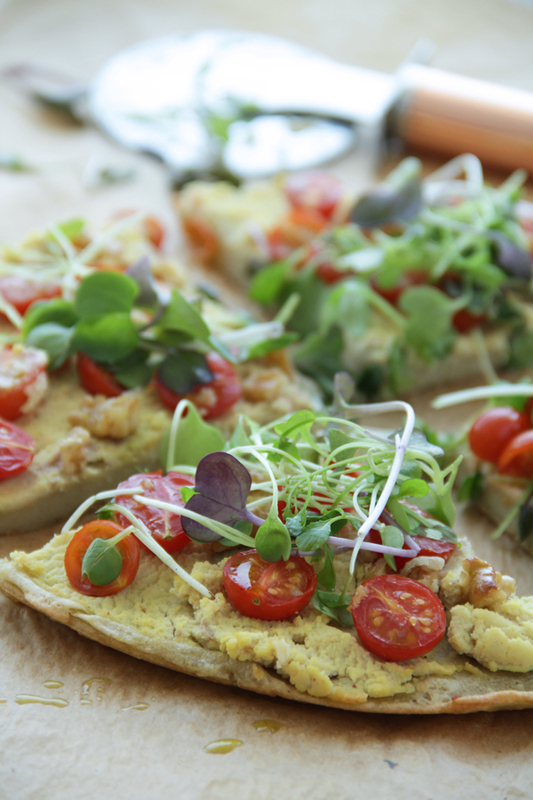 Top with a bunch of sprouts/microgreens and any additional toppings - herbs, salt, black pepper or pepper flakes. Drizzle hemp oil on top if desired. Slice and serve with green salad. Feel free to change up the toppings, using tomato sauce instead of vegan ricotta, try different vegetables, herbs and nuts/seeds. Bon Appetit, we hope you enjoy it!